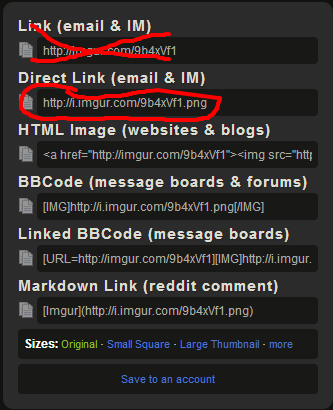 I am using imgur and imgbb, they used to work perfectly fine, now all of a sudden when I look at the preview after I added the link of an image through the appropriate button, it says that I am not allowed to use that image extension, and all I see in the post is the broken image icon. I tried to upload files in jpg, png, bmp and gif extension. It depends on which link you use. The first one is direct link then I use the image link above to insert the img. The second pic I used BBCode, the third Linked BBCode which also directs you to the pic on imgur. If the link for the pic does not end in the appropriate extension you will get that error. What browser and version are you using? And can you describe the steps and links you are using? Edited by Tarl Cabot, 14 October 2018 - 02:46 PM.